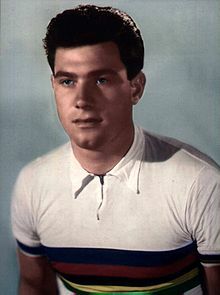 Marino Morettini (2 January 1931 – 10 December 1990) was a road bicycle and track cyclist from Italy, who won the silver medal in the men's 1.000m time trial at the 1952 Summer Olympics. At the same Olympic tournament he claimed the gold medal in the men's 4.000m team pursuit, alongside Loris Campana, Mino De Rossi and Guido Messina. He was a professional rider from 1954 to 1963. ^ "Marino Morettini Olympic Results". sports-reference.com. Retrieved 2012-12-28. This biographical article related to an Italian cycling person born in the 1930s is a stub. You can help Wikipedia by expanding it.